Fully engaged in the celebration for the years first snowstorm, after making the three hour drive back to the compound from North Stratford, NH, I slept well, then followed breakfast with a drive over to Plattsburgh. Again, the Vermont roads were in worse shape than New York's. Great snow tires and no traffic made for an enjoyable combo to help deal with the weather! 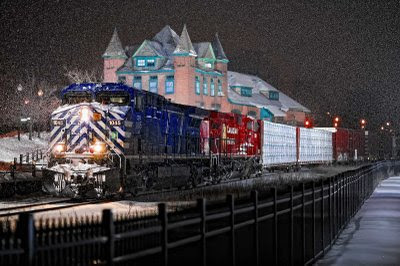 Arriving in Plattsburgh, after an hour or so of no activity on the scanner, I decided to set up the lights anyway, gambling on a southbound before morning, a safe bet here on the North End, where three southbounds are scheduled nightly. Halfway through setting up the dispatcher comes on the airwaves, speaking with 250 arriving to my north in Rouses Point! Then I hear of 252 trailing behind 250! Wow! I may see both trains here tonight! I mentally check the weather forecast which said snow between three and five a.m. and smile! All set-up later in the hour, the dispatcher tells 250's outgoing crew to plan on working at Bluff Point Yard from the siding, which tells me of plans to run 252 around them, or at least to run 252! A rare night indeed, two photo opportunities. 250 had a 9500 series leading, wearing the ragged "dual-flag" paint scheme, and in spite of this, looked pretty good passing the station wearing the trademarks of doing battle with snowdrifts up north. I noted the trailing CEFX AC as the preferred unit to see leading here over a 9500. Oh well! The photo was worth the trip over. Within the hour 252 was recrewed and departed Rouses Point as 250 finished it's work and left Bluff Point Yard. I did'nt touch a thing with the set-up or lens focus, remembering the chain reaction that can occur when one does a little too much tweaking! The dispatcher does'nt address 252 by his lead unit, so I'm in suspense as they pass the talking detector eight minutes out.............and acknowledge the detector's message with their train number and lead unit......CEFX 1045! I look over the view once again, and think, but the snow has stopped......I would like some snow please! It starts to snow! Thinking I might be onto something, I wish for bigger flakes, (I mean......come on, I've been given the desired locomotive leading....) and the snow increases in intensity, with bigger flakes! Wow! Could mind's intention be this powerful? I follow that thought with the obvious, take a good shot of this CEFX unit. 252 is whistling on the north side of the city, a couple minutes out when this jogger comes down the street, I ignore him as he jogs by, then he turns around, not wanting to be caught by the train, and jogs up by me again, I offer a "good morning" to him, he returns the greeting, then he stops, and says...."great photos"! I'm concentrating on the incoming 252 more than the jogger, and I'm caught by surprise, and respond..."what...what's that?" He replies, "I've seen your photos....they're great!" I thank him, contemplating how in the world does he know of my photos, as he jogs off up the road, then I remember the article which ran in the Plattsburgh paper's quarterly magazine, ha,ha! To be so fortunate! As CEFX 1045 leads 252 through the city, he returns down the street to watch the flash units do their thing. And they do it well, with the falling snow adding to the scene! I let the head end run further towards me this night, to try and accent the cab lines and station towers more. One of my best results from Plattsburgh I think. After spending time on VRS and SLR, with their GP 40's, it quickly becomes evident returning to CPR's D&H, that we are outside of New England now, no matter how close we are physically. 136 pound continuous welded rail get's my appreciation, as do the AC4400's which seem to be immense machines after shooting GP 40's! Within minutes of 252's passing, the snow stops! I don't know....but I sure counted my blessings! Shot on January 8, 2009 at 05:51 with the 5D and Zeiss ZF 100/2 (Nikon) lens set at f2. One flash to left of 1045's cab erased in photoshop. Please enjoy! Comments are welcomed.